Before designing our wedding invitation book, I enjoyed working on our "Save the Date" card, which I based on a French Casablanca movie poster. Before I designed our wedding invitation book, I tasked myself with designing a Save the Date card that would demonstrate my Photoshop skills. I wanted to reference something classic, and I found a French Casablanca movie poster that looked fantastic, so I decided to use that. 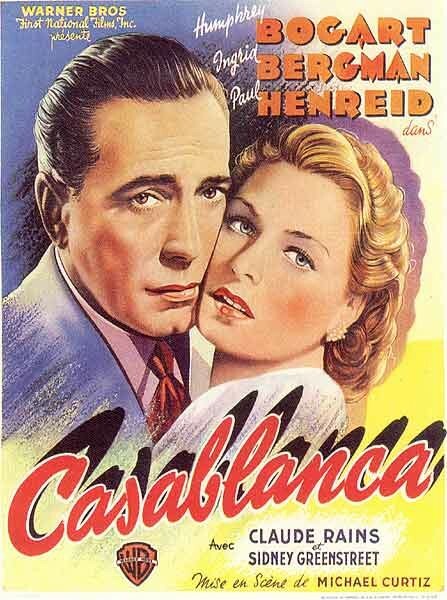 The original French Casablanca movie poster (1942). Dashing...ravishing...don't you think? Here's looking at you, kid! I can't find the Photoshop file. If I could, I'd love to zoom in and show some of the detail I went into such as adding film grain and other textures, or slightly offsetting red and blue layers to mimic the printing press being slightly out of register (this was all done before Mister Retro Photoshop filters, which make short work of effects like that). It was a fun challenge to try and utilize all of the different typefaces from the original poster, and I remember it taking a long time to find all the right (close) ones. Looking back on it, I'm still happy with the result. I don't think I could do much better now, even with many more years of experience.